First Day of Sale: June 14, 2017 (8:00 a.m., ET) – The Bureau of Engraving and Printing (BEP) is pleased to introduce the 2017 $2 Triple Deuce Currency Set. The set features a Series 2013 and two Series 2009 $2 uncirculated notes from the Federal Reserve Bank of Dallas, with matching serial numbers beginning with 2017. This set is attractively packaged in a tri-fold folder and each note is protected by a clear, acid-free polymer sleeve. A limit of five sets per household is in place during the pre-release period, June 14 – 20, 2017. Unrestricted sales begin June 21. This product is limited to 3,500 sets. Act now and be among the first to own this historic currency set. 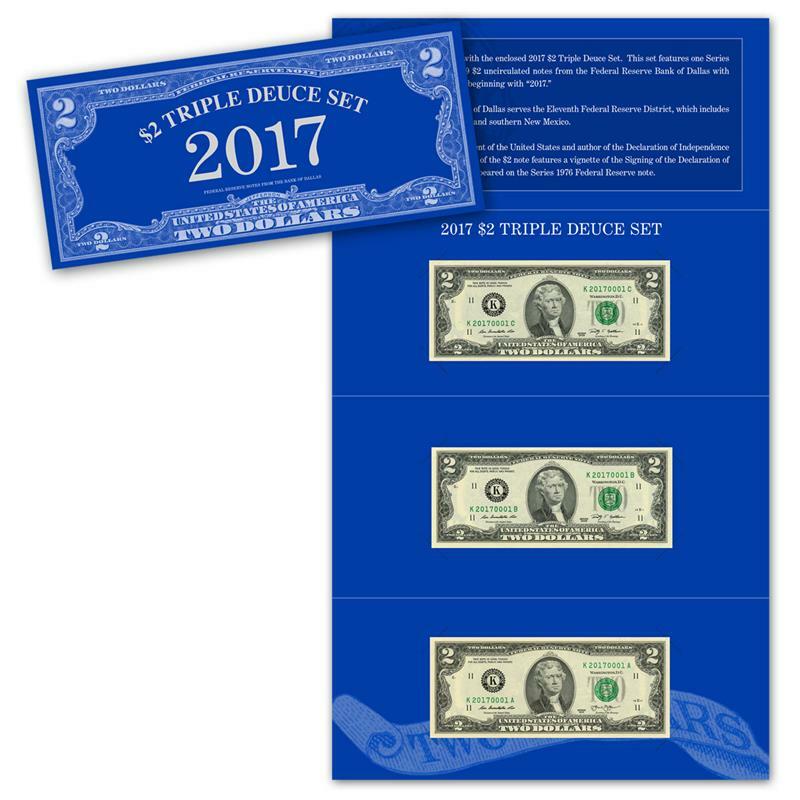 The 2017 $2 Triple Deuce Currency Set is $59.95. Bulk pricing is available at $54.95 for quantities of five or more. This product is offered during calendar year 2017 only. For additional information about BEP or to purchase products, please visit bep.gov or follow us on Facebook and Twitter @USMoneyfactory. BEP products may also be ordered by telephone (1-800-456-3408), by fax (1-888-891-7585), or mail (Bureau of Engraving and Printing, Mail Order Sales, 515M, 14th and C Streets SW, Washington, DC 20228).